Usually, I fire about 200-300 rounds to test it's reliability, ammo preferences, feel and to gain a good level of proficiency with a new gun. Once I know it intimately, I carry it. So...400? I just bought a new one, so it got me thinking...how much testing do you put yours through? My latest, 500 and some change. Not a hiccup, achieve an average of a 2.5" group from 20 or so yards. Putting it in the holster when I go out in an hour. I think I shot more because it's been a while since I got some practice. Feels good! Made some HP out of Serbian surplus, too! 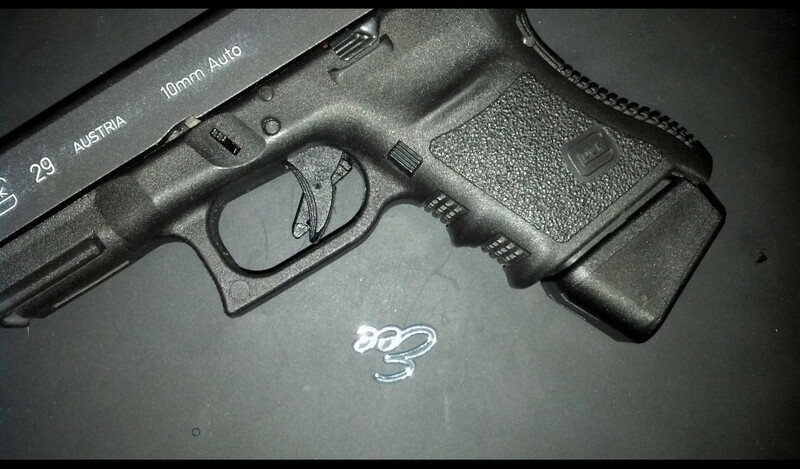 With my Glocks, I shoot 1 or 2 rounds just to make sure it fires. After that, I check for wear around 10,000 or so. 300 is my standard. However, all weapons are different and some just perform better after 500 rounds. I get to 500 rounds pretty quick because I bring family and friends to the range and have them shoot my guns as well. My SR1911 had Failure to eject issues a few times during the first 50 rounds, after that not a failure of any kind. Tight springs are the reason for many failure issues. Also, a highly polished feed ramp helps to eliminate some issues. Remember, these are just my personal observations. I put a couple hundred through my 10mm before setting the 40 aside. I make sure if I switch up carry ammo that I fire a 50 round box to see if it eats them up ok. I did see if I could make my glock fail by "limp wristing" it and sure enough, it can be done but it's scary doing it... My normal grip works well though. On a serious note, I have run into limp wristing as well. It happened to me with a G27 that I couldn't get a proper grip on without the extension. I do have a G20 OD model with a picatinny rail and red dot for hunts, and do pretty well with that. On all my pistols I take them down and dry them out so there is no lube in it. it is all baire metal then I run it hard on the range i run drills work on draws anything I can do for at least 300 minimal rounds then I go home and with my drimal I buff out every friction mark and run it with and only FrogLube. I shoot 3 gun and iron man and have been doing this for years never a issue. With a new model/style I would not feel good with anything less than 100, with a 1911 I would test for ammo function and mags then if I group well I would carry. Glocks are funny, for me, and I would want to feel it if it were anything other than a Model 22 Gen 4. I understand that feeling. I've been using a 20 mag with grip extension but couple weeks ago got a +2 for the 10 mags which gives very good grip. I like the +2 better than the 20 with extension because the extension gives you a tiny gap which will pinch the stuffing out of your little finger. I have noticed that the second shot if done super fast is about 3" higher than the first at the 10 yard range so if I get my groups tight, it does take longer to get 3 shots down range. I've been looking at the extended ported 10mm barrels and maybe even a stiffer spring to get less muzzle flip. Brave man or is this tongue in cheek. I just like the hell out of this post!